Research in an arid area of Texas has yielded a statewide rainwater harvesting award for a group at The University of Texas at El Paso. 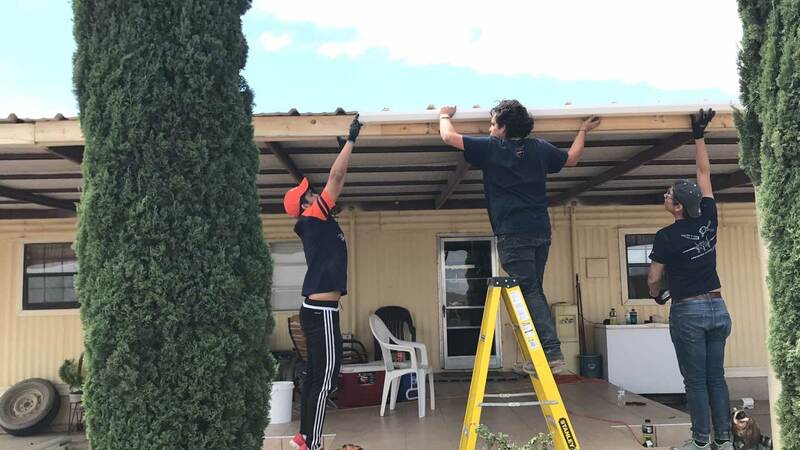 Student volunteers from The University of Texas at El Paso help install a rainwater harvesting system at a home in the Las Pampas colonia near Presidio, Texas, in this June 2017 photo. William Hargrove, Ph.D., director of UTEP’s Center for Environmental Resource Management (CERM), accepted a Texas Rain Catcher Award on Wednesday, March 21 during the Texas Water Development Board’s regular meeting in Austin. The Texas Rain Catcher Award promotes rainwater harvesting, educates the public about the benefits of rainwater harvesting and recognizes those dedicated to conserving water resources. CERM is receiving the award in this year’s residential-community category for its work in 2017 in the Las Pampas colonia outside of Presidio, Texas. UTEP was awarded for its work to reduce the need for the colonia’s residents, many of whom are elderly, to haul water for their household needs from Presidio, a small town about 250 miles southeast of El Paso. CERM, along with Engineers for a Sustainable World, a UTEP student group, and Coca-Cola Bottling Co. constructed rainwater harvesting demonstration systems at two homes. Some of the project costs were paid for by a grant from the USDA National Institute of Food and Agriculture. Last year, UTEP students made the four-hour trek to Las Pampas to install the system that was built to collect 2,200 gallons of water. The water will be used for gardening, landscaping and for livestock use. For residents, the amount of hauled-water use has been reduced by 50 percent, saving each household with the system about $15 to $20 a month. Hargrove said the effort was greatly aided by Jesus M. Placencia, a UTEP alumnus who earned his bachelor’s degree in civil engineering in 2015, and completed his master’s in civil and environmental engineering in fall 2017. Placencia designed the rainwater collection system that was installed at both residences. Hargrove added that he is glad he could provide opportunities for engineering students to implement the skills they have gleaned from their years of classroom instruction. “It’s important for them to get this hands-on experience,” Hargrove said. “They’re used to designs of projects. But they don’t get many opportunities to actually implement the design. So, this was a good experience for them to get practical experience associated with their educational training. He said it is also important for the students to be able to work in a community to which they have a connection.